Caitlyn Jenner, surrounded by her children, will accept the prestigious Arthur Ashe Courage Award on Wednesday night. The event is another step in Jenner's transgender transformation: she will be speaking in front of her sports world peers, at ESPN's annual ESPYs ceremony, and in front of a national audience on ABC. The award will be presented to Jenner by the famed soccer player Abby Wambach, an ESPN spokesman told CNNMoney. Wambach is, like Jenner, an Olympic gold medalist. She was a key member of the U.S. women's soccer team that won the World Cup earlier this month. She celebrated the victory by running over and kissing her wife -- a moment that immediately went viral on social media. If the recent past is any indication, Jenner's speech at the ESPYs will be viral, too. Jenner, formerly Bruce, identified as transgender for the first time in an interview with ABC's Diane Sawyer that was televised in late April. That same day, her ESPYs award was announced by ESPN. Vanity Fair said it would be "Caitlyn's first major public appearance." 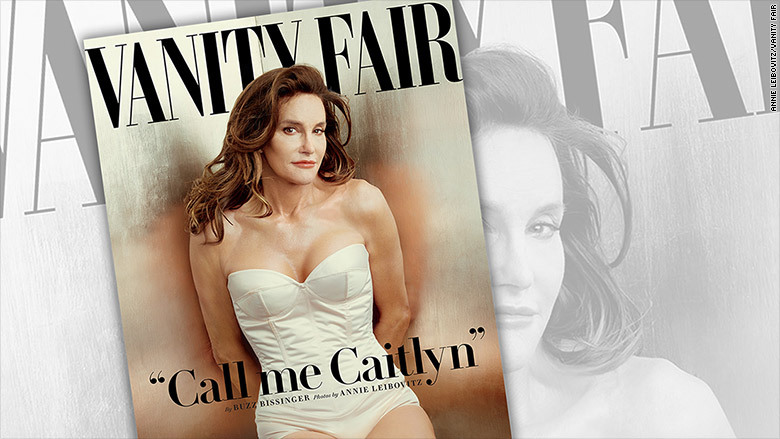 Jenner's gender transition has made her, by some measures, the most-recognized transgender person on the planet. Activists have said her public appearances are educational opportunities that help expand awareness of a once-marginalized community. That's one of the reasons why many people will be paying attention to what Jenner says when she steps up to the microphone on Wednesday night. Although her gender transition has received a huge amount of media attention, Jenner has said little in front of cameras in recent months. That will change at the ESPYs. Past recipients of the Arthur Ashe Courage Award have delivered heartfelt speeches; the 2014 honoree was Michael Sam, the first high-profile NFL prospect to come out as gay. In announcing the award for Jenner, ESPN cited Jenner's "athletic prowess and determination" at the 1976 Olympics and the "strength of character" that she displayed in her ABC interview. ESPN and ABC are both owned by The Walt Disney Company. This is the first year the ESPYs are being televised by ABC instead of ESPN; because it's on broadcast, not cable, a bigger audience is likely to tune in for the star-studded annual event. Jenner's recognition has been accompanied by a significant amount of controversy. Some critics said other athletes were more deserving of the courage award, and false information about an alleged "runner-up" spread via Twitter and Facebook in June. ESPN said there was no such "runner-up." Bob Costas, the legendary NBC Sports broadcaster, was also critical, suggesting that the Jenner award is "just a crass exploitation play, a tabloid play." ESPN has rebuffed that, as well. In an interview with Sports Illustrated, ESPYs co-executive producer Maura Mandt said the selection of Jenner was not a publicity stunt. "I think Caitlyn's decision to publicly come out as a transgender woman and live as Caitlyn Jenner displayed enormous courage and self-acceptance," Mandt said. "Bruce Jenner could have easily gone off into the sunset as this American hero and never have dealt with this publicly. Doing so took enormous courage. He was one of the greatest athletes of our time. That is what the Arthur Ashe Courage Award is about, somebody from the athletic community who has done something that transcends sport." As for Jenner herself, she has called the award "truly special" and said "for the first time this July, I will be able to stand as my true self in front of my peers."